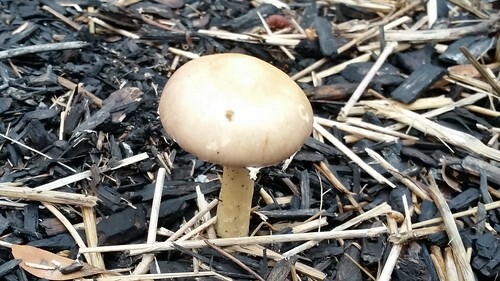 A mushroom in the middle of a mulch bed. I always found mushrooms as curious things. In part, I blame the Smurfs for that. But I was also curious by how quickly they would spring up. For instance, this fellow was not there on my daily walk on day and showed up the very next day, fully formed like this. That always struck me about mushrooms is how quickly they form. This spongy feel always make me think about them rising out of the ground like a balloon quickly filling with air pockets. They also are weird in shape, compared to the things around them. Bulbous, spongey, and breaking apart with an ease that defies the branches, leaves, and grass blades that either snap or tear. They are a curious life-form and I can understand why so many science-fiction tales have used them or referenced them when talking about alien invasions or strange life forms.